Advertising Agency rankings are a great one day phenomenon of jubilation for Agencies that feature in the top brackets and a day of mourning for agencies that don’t (or get reduced ranks!). This has been the trend in the industry for the all the years when the rankings of agencies by ’unbiased, credible and respected sources’ have been in place which is probably nearly 30 yearsnow in India (except broken for quite a few years in between) between A&M Magazine, who started it in India and Brand Equity (who calls it “Agency Reckoner”) have been doing it for a number of years now. 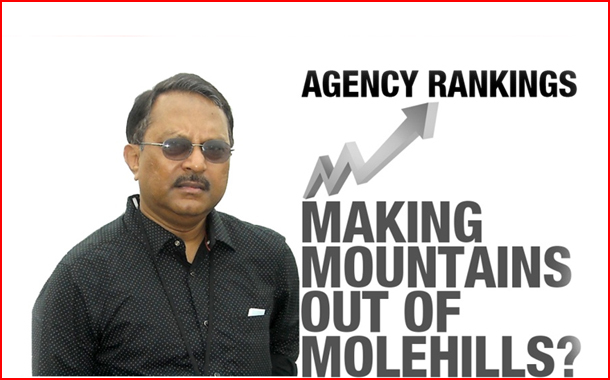 Let me delve a bitintothe history of Agency Ranking in India. It was started in the late 80’s (probably in 1988/89) by A&M Magazine, the then leading magazine on Advertising & Marketing and rankings were based on the Gross Income (‘revenue’ in common ad agency parlance) generated by the agencies and the capitalised billing was calculated by the gross income multiplied by 6.67 (if the gross income is Rs. 15 then the capitalised billing is Rs. 100, 15% being the standard and traditional agency commission). The A&M reporting and ranking was based on the final audited Balance Sheet of the agency in the previous year certified in original by the lead partner of the Chartered Accountant Firm that had done the audit (not by a third party auditor). This was strictly a ranking, based on the gross revenue generated, and therefore only a financial performance ranking. Globally even today this is the way ranking of ad agencies and their Holding Companies are done in most countries as all the big agency groups’ turnovers and incomes (including all financial health parameters like capitalised billing, gross income,share value, income per share, dividend declared, PBT, PAT) which are all in public domain and are quoted in the StockMarkets in their respective countries. In India, very few agencies (if not any) are publicly quoted companies in the Indian Stock Markets, and therefore A&M those days used to ask agencies to submit their Balance Sheets duly attested in original by the CA Firm based (which did the audit)on which A&M did the financial ranking. The A&M rankings continued till early part of the new millennium, but by then A&M magazine was on a decline path and closed down subsequently. The only other tabloid format advertising journal“The Brief”too lasted for a few years (though they did not attempt any Agency Ranking) and died a natural death in the early 2000’s. When the era of Advertising Portals began, none of the advertising portals took up the cudgels of agency ranking as they possibly found it to be difficult to be non-controversial, unbiased, authentic and credible. We advertising intellectuals in India also started questioning the ‘gross income methodology’ adopted by A&M in India, with the argument that “advertising is a creative profession! How can one rank agencies on the basis of gross income (a financial parameter) in a profession as creative and pristine as advertising is?” They possibly ignored the fact that world over no one had yet been able to discover an unbiased, non-controversial and authentic methodology of measuring agency ranking based on factors like creativity, reputation, clients and brands they handle, personalities behind the agency, quality of service and all these intangible factors. It was also argued by the advertising intellectuals that Awards won alone cannot be the benchmark of creative agencies as ‘Award winning advertising’ is often created for ‘winning Awards’ and not necessarily for the brand. We agencies after all are in the noble business of building brands and our greatest awards are the success of the brands in the market. Now that’s opening another can of worms! Then began a new and noble initiative by Brand Equity of ranking agencies, the “Agency Reckoner” (creative,media, digital, production houses, design agencies, influential people in creative and media etc.) based on the agency’s ‘brand image and reputation’ (two very controversial and grossly abused parameters in our industry ) through online and face to face interviews with reputed professionals From different industries including advertising and marketing by an independent research agency. So for agency ranking we moved From one extreme of the spectrum to the other in a span of 15 years! We moved From the extremely tangible parameter of financial ( gross income) yardstick to the other end of extremely intangible parameters ( reputation, brand image, proactivity, broad spectrum services, providing effective strategic and creative solutions, et al ) as perceived & judged by 197 industry professionals ( Brand Equity Agency Reckoner 2017/18 all India sample size) and 171 professionals ( totally online ) in 2016/17. It was a complete 180 degree shift in methodology! On the sample size we don’t even know what are the break-ups per city, based on what parameters these ratios per city have been worked out and what are the parameters of selecting the sample of interviewees and how have they been chosen. While I am not casting any aspersions on any organisations or individuals, there are certain facts we need to confront with. For instance, there has been a traditional bias towards Mumbai based agencies though Mumbai’s ‘cosy-club’ of agencies does not today account for the substantially big pie of advertising creation, production and spends, as was in the past. Besides Delhi (which in terms of advertising talent pool, creation, execution and spends does not lag much behind Mumbai), Bangalore, Chennai, Hyderabad, are today also very large centres of advertising. Large cities like Kanpur, Surat, Baroda, Ahmedabad, Indore, and many more are also contributing substantially to this advertising pie. I am not sure whether the traditional perceptions that still exist in the industry (that may be leading to biases in sampling both in qualitative and quantitative terms) have been factored in or not. The published methodology in Agency Reckoner in Brand Equity does not throw any light on this. Now imagine this! Based on such surveys on totally intangible factors by a sample size less than miniscule (I am being very modest in my choice of words! ), the fates of creative agencies, media houses, digital agencies, production houses and professionals are headlined on a D-Day every year in June or July. The jury gets out and fates are sealed! No one protests in public as either they think it does not impact their lives or it’s not taken seriously by anyone including the winners and our industry’s credibility becomes the victim of such exercises. I am not against agency rankings in India. In fact I am all for it. But there needs to be a far more credible,robust and unbiased methodology to arrive at the rankings. And it should be a mix of tangibles and intangibles. Financial performances can’t be wished away. Gross incomes of agencies, status and size of clients and brands they handle (does an agency handle one of the top 3 brands in a category, or a brand leader), client’s brand loyalty with an agency (how many years an agency is working with a brand), the infra-structure the agency has (it’s very tangible), client satisfaction (call up / mail clients personnel and ask them about their satisfaction index on a 1 to 10 scale of their specific existing agencies rather than general questions about ranking top 10 or top 50 agencies, as is currently the process), new business gained and businesses lost by agencies ( again very tangible), and many more issues that can be evaluated fairly. Of course Awards, the reputation of top professionals behind the agency, the breakthrough ideas, campaigns or innovations they have created in that year, and many more intangible parameters need to be factored in as well. In my opinion, this is an advertising industry issue and can’t be left only to the mercy of one research agency and one media house taking up the cudgels of ranking agencies by methodologies that cover intangibles and perceptions of a select few and sample sizes that, to put it mildly, are less than adequate. There are bodies like Advertising Agencies’ Association of India ( AAAI), in which leading professionals are actively associated in the AAAI Executive Committee and they surely can apply themselves to work on a more robust structure and set guidelines for agency rankings in active co-ordination with Brand Equity and A C Neilson who has been doing the surveys with professionals to arrive at Agency Rankings. In such an effort, even ISA (Indian Society of Advertisers) can be roped in to advice and guide through a joint committee of AAAI & ISA. We at AAAI have always had such cross disciplinary Joint Committees to address burning industry issues, and I believe Agency Ranking is a matter that deserves such wealth of experience From professionals to work out a robust methodology for future agency ranking. After all, who understands the advertising industry better than the advertising professionals themselves and their clients? The author of this article is Tapas Gupta , Founder & MD – BEI Confluence Communication Ltd.